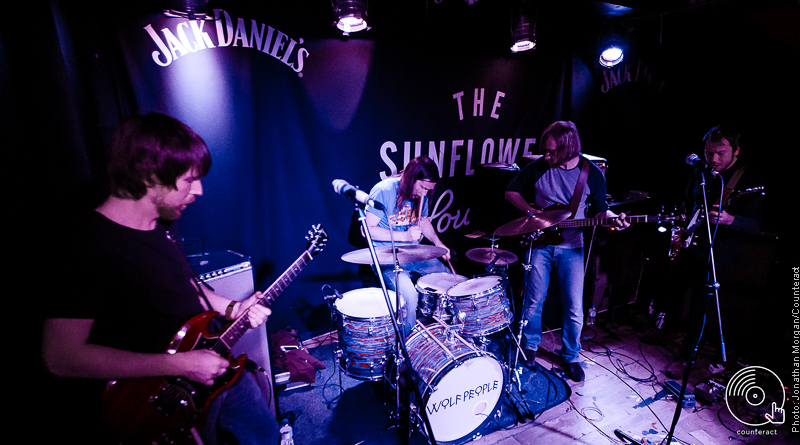 Admittedly, gigs at The Sunflower Lounge are always a bit on the snug side when bands that rarely play Birmingham include the venue on their tour and Birmingham Promoters ensured this gig was no exception with Bedfordshire born, psych/folk 4 piece, Wolf People, headlining the evening. With doors opening at 7.30pm the room was quickly filling up as the opening band, As Mamas, took to the stage. 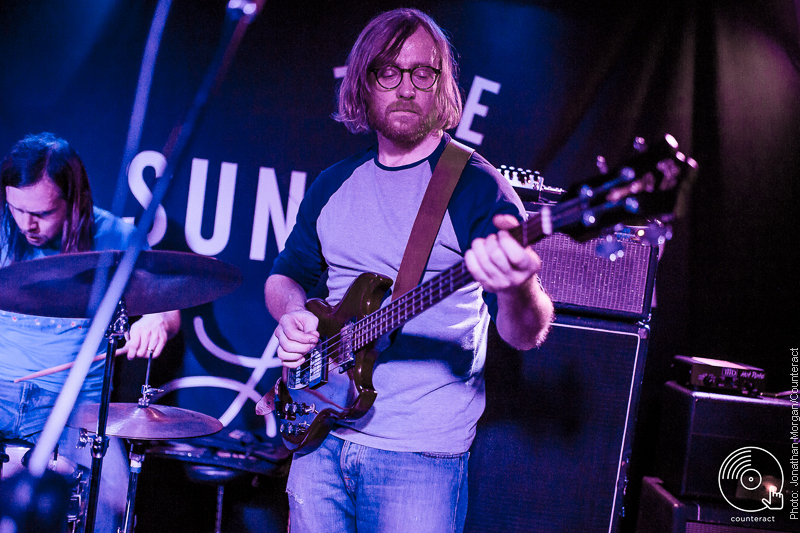 Having recently been interviewed on Switch Radio for their ‘Made In Brum’ programme and having released their self titled EP in June, the Worcestershire duo confidently began their 10 song set. With a sound that blends blues rock with psych and a touch of reggae and ska inspired rhythms, As Mamas, proved to be a loud 2 piece that played a varied and interesting set. Including songs such as, the echoed haze of ‘Zenobia’, the upbeat growling vocal of, ‘Midnight Floor’, along with the reggae influenced, ‘Mama Moved’, the variety of musical styles and influences making up their choice of tracks along with the relaxed stage presence from the duo got the night off to an agreeable start. 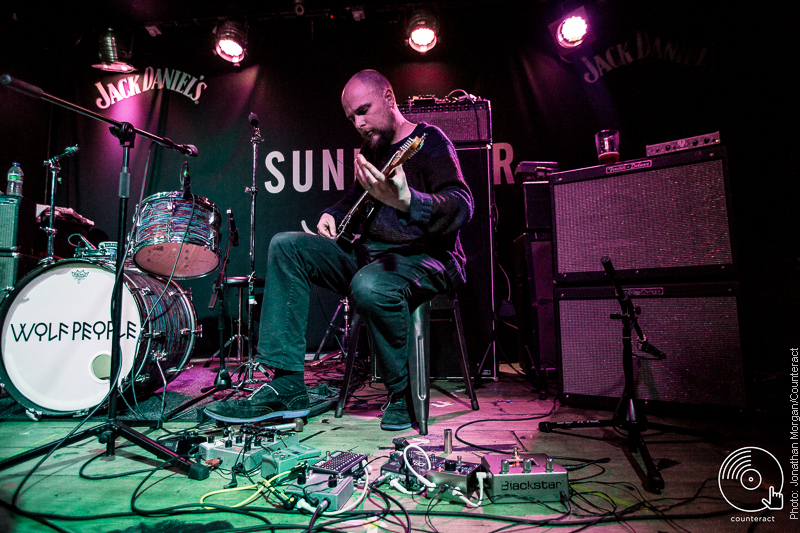 Next up was West Yorkshire based electric guitarist/solo music experimenter, Dean McPhee. With his music being highly acclaimed by publications, such as, The Wire, Uncut and The Quietus, and having previously supported folk music veteran, Michael Chapman, Dean’s melodic guitar lines, chiming resonance and hypnotically fluid layers of improvised soundscapes created through a Fender Telecaster and various effects pedals, amounted to an ambient and free-ranging creation of harmonics. As oppose to playing a set of individual songs, Dean’s performance was him simply choosing to focus on producing one cyclic constant of textural sounds, arched over his guitar in peaceful solitude despite the room getting fuller by the minute. Given the ambience of his music in comparison to the first support band and the heavy riffs that were expected to follow from Wolf People, Dean McPhee seemed a slightly obscure choice of a second support act. 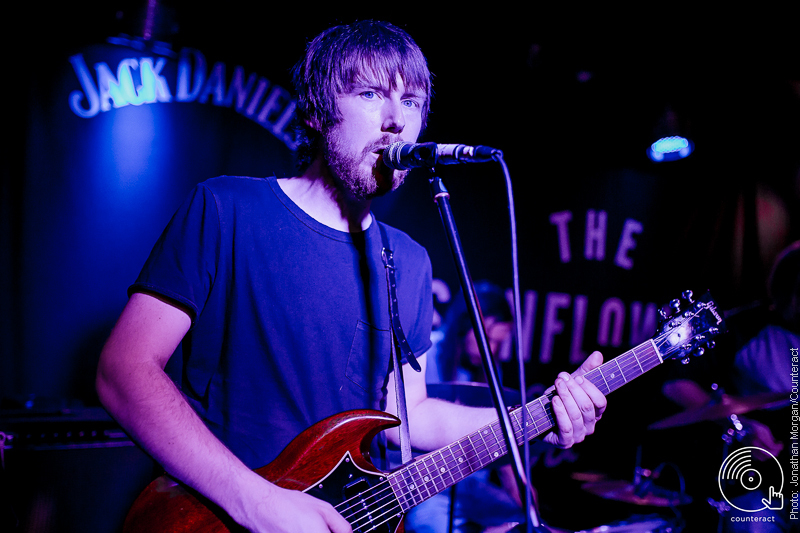 That being said, including a musician that is focused on breaking through the barriers of musical constriction by experimentation and playing the unexpected for someone that has previously been described as a’ folk guitarist’, meant that Dean succeeded in making this an alluring performance. By the time Wolf People took to the stage, any comfortable standing space was nowhere to be found and it was clear that their popularity was underestimated. With their new album, Ruins, being released on 11th November through Jagjaguwar records and being themed on the ruins of civilization and nature reclaiming the land, the band began their set with the album opener, ‘Ninth Night’, an appropriate example of the duality of Wolf People’s music and the cross-pollination of history with modern day ideals. The opening notes were delicate, intricate and echoed the recurring influence of pagan folklore and myth, although the tranquility gave way to a noisy, distorted, psych embracing fuzz, with lyrics consisting of the incantations of 18th Century burglars and vagabonds. Their riffs are bluesy and heavy, the bass-line rolls and the drumbeats thud throughout tracks such as, ‘Silbury Sands’ to create a deep wall of sound giving a respectful nod to the early 70s influence of bands such as, Black Sabbath and Jethro Tull. 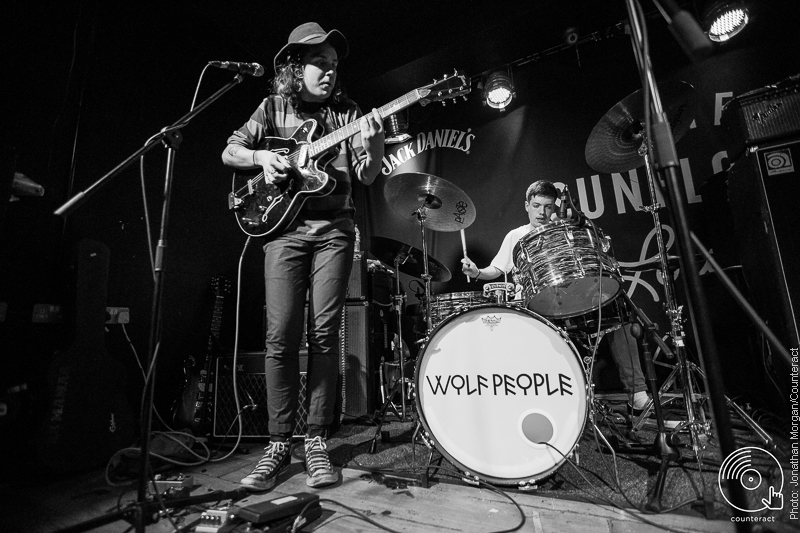 Wolf People are masters at the loud/quiet dynamic and this is made more apparent when hearing them live. Songs such as, ‘When the Fire is Dead in the Grate’ and ‘The Banks of Sweet Dundee’, have all the vocal elements of soft and sombre folk harmony, an undercurrent of medieval tales and intricate percussion, although, when the band switch to heavier tracks, such as, the latest single, ‘Night Witch’, they do not fail in being able to power through soaring guitar riffs and retro distorted blues chaos to a head nodding, sweating crowd. Having played a 9 song set it was unexpected that the band would play an encore, but after announcing that it would ‘be difficult to pretend to leave and come back again through a jam packed room’, the band kicked straight into a faultless ‘One by One From Dorney Reach’, which was clearly a good choice if the cheers from the audience was anything to go by. With an audience member interjecting that they were ‘the best band I’ve heard this year’, to which the band replied, ‘It’s November, so that’s good!’, it is safe to say that although Wolf People hold a torch to the influences and styles of the past, their music and the amount of gig attendee’s appreciating every minute of it shows an optimistic future. English and Media Studies graduate, frequent traveler, vinyl and vintage enthusiast….fan of delta blues, folk, 60s/70s rock, psychedelia and the many gaps in between. Favourite artists include Wooden Shjips, Radio Moscow, All Them Witches and too many others to mention. English and Media Studies graduate, frequent traveler, vinyl and vintage enthusiast....fan of delta blues, folk, 60s/70s rock, psychedelia and the many gaps in between. Favourite artists include Wooden Shjips, Radio Moscow, All Them Witches and too many others to mention.